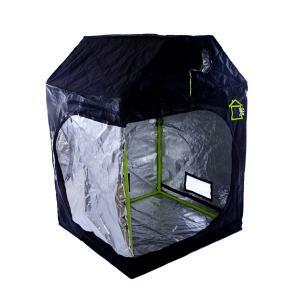 The Roof Qube RQ150 Grow Tent is a great solution for those who want to grow in a loft or attic space. The Roof Qube tents are high quality and the slants in the roof mean that this tent will help you take advantage of the space you have. Great product! The Roof Qube RQ150 Grow-Tent is a quality grow-tent that has a slanted roof so that you can take full advantage of the space that you have. The tallest part of the tent (from floor to highest part) is 1.8 metres while the height of the tent at the shoulders is 1.4 metres. The frame of the tent is made from very strong metal tubing with metal corner pieces and the roof has 2 extra rails for hanging your reflector and carbon filter from. The fabric of the tent is very tough, light-proof, incorporates tough zippers and has a very highly reflective silvered interior to ensure you can make the most of the light from your lamp. The tent incorporates 4 x 9" ducting points, 1 x intake sock and 3 x cable socks. All the ducting and cable entry points incorporate a sleeve with a draw-string fastener to ensure there are no light-leaks into or out of the tent. The rear and sides of the tent each have a rectangular ventilation panel with an integral bug-screen and a velcro-fixed cover-flap.